Find fast answers to common questions about the landing page and website page tools. Can I restore previous versions of my landing page or website page? How do I float images for a text wrap effect? Can I use personalization on my page? How do I link to a PDF after a visitor submits a form on my landing page? How do I embed a video or audio file on my page? How can I change the background color for one page? How do I set an expiration date and time for a page? Why won't my page publish? Can I associate a page with more than one campaign? Can I recover a deleted page? How often does data on the landing page dashboard update? If I change the URL of my page, will the analytics be deleted? How do I see the analytics for a specific timeframe? What is the difference between submissions and a new contact? If a contact submits multiple forms and becomes a customer, will they count as a customer for both of those landing pages? If I view and test a form on my own landing page, will my test be counted? Why are recent form submissions not appearing in my landing page's analytics? How are duplicate form submissions handled? You can review saved versions of your page using the page revisions tool. As you're working on the draft of a page, your changes will be saved every time you click the Save button in the upper right. After your page is published, any new published versions will also be saved in the revision history. You can float an image in any rich text module with the alignment options for any image. First insert the image you want to be positioned on the page. Then click on the image in the content editor to open its formatting options. You can personalize your pages with any contact property or custom property. When you add a personalization token, be sure to also include a default value for any new visitors. In order for personalization tokens to show a value for a contact, the contact must have a contact record in your HubSpot account and have a known value for the property used as the token. For more details about landing page analytics and conversions, see our frequently asked questions. There are two ways to share embed-style content: use the embed tool in the rich text editor or add the embed code to a coded module. For pages using rich text modules, use the embed code icon embed to access the HTML of the module to add the embed code or file URL. The background color of an individual page can be changed by adding simple CSS to the head HTML of a website page or landing page. In your HubSpot account, navigate to your landing pages or website pages. Hover over the page you'd like to customize and click Edit. Add the following code in the Head HTML section. Replace the color red with the color of your choice, either using the name or the HTML hex value. Click Save when done, and then hit Update or Publish. Please note: if you aren't seeing the background color change as expected, reach out to your designer or the Design Forum. You can expire a page and redirect visitors to a new URL after your promotion is over or event date has passed. In the Settings tab of the page editor, click the When a page expires, redirect visitors to dropdown menu to select where this page should redirect after it expires. Select one of your published HubSpot pages, or click + Enter an external URL to redirect your HubSpot page to an external page. Why will my page not publish? 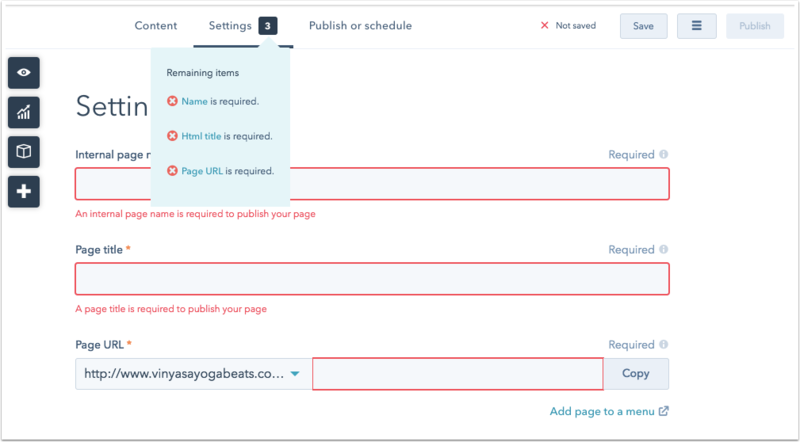 HubSpot's pages and blog posts require a value in the name, page title, and page url boxes before the Publish option will appear in the editing interface. Any content you publish must also have a unique URL. Each individual landing page and website page can only be associated with one campaign in HubSpot. Adding assets or content that are already associated with another campaign to a new campaign will remove them from their current campaigns. At this time there is no way to recover deleted HubSpot pages in the app. If you have accidentally deleted a HubSpot page that you need restored, contact Support. How often does the data on the landing page dashboard update? Analytics and metrics on the page dashboard will update every 20-30 minutes. The data will not disappear from the page dashboard if you change a page's URL. HubSpot uses a unique identification number for each of your pages to track their performance. This allows a page's URL to be changed without any disruption to your data. Please note: unlike the landing page dashboard, the pages report considers pages unique based on URL. If you change a landing page's URL, pages will track views of the page at the new URL instead of the old URL. How do I see analytics for a specific time frame? To view a page's analytics for a specific time frame, navigate to your landing pages or website pages. Hover over your page, click the More dropdown menu, and select Details. On the Performance tab, click the Date range dropdown menu to segment analytics for a custom date range. What is the difference between submissions and new contacts? Submissions indicate the number of times a form on the page was submitted. New contacts indicates the number of visitors who became a contact by submitting the form on the page. If a contact submits multiple forms and becomes a customer, will they count as a customer for all of those landing pages? The contact will only be reflected as a customer in the analytics for the first landing page they submitted. 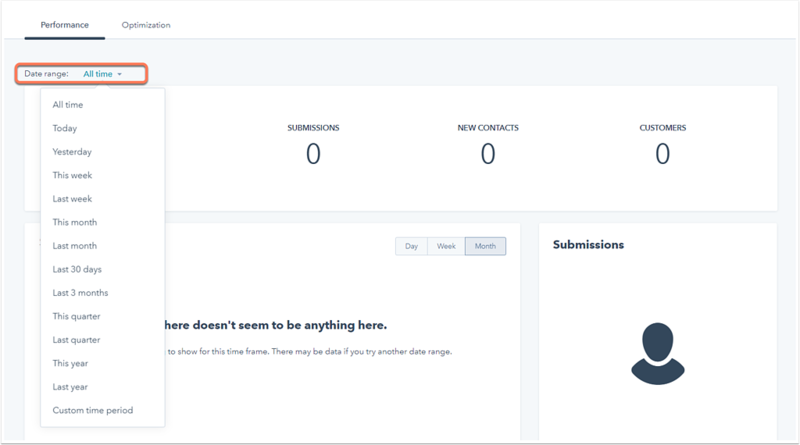 They will count towards the submissions on all five landing pages, but will only appear under New Contacts and Customers on the first landing page they completed. If I view and submit a form on my own landing page, will my test be counted? If your IP address is filtered from analytics in your reports settings, your test views and submissions will not count towards the page's submission data. Why are recent form submissions not immediately appearing on my page's analytics? There can be up to a 20-30 minute delay between when a contact submits on a form and when that submission appears on that page's analytics. To see the most up-to-date submissions on a form, navigate to your forms dashboard. In your HubSpot account, navigate to Marketing > Lead Capture > Forms. Hover over the form on your landing page and click the Actions dropdown menu, then select View submissions. Every form submission will count towards the submissions total in your page performance. If the same contact submits the form on your landing page more than once, each of these submissions will be counted.